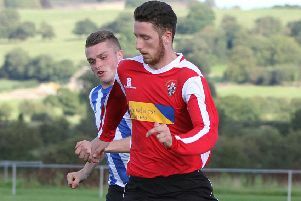 Lee Ashcroft was pleased that his Longridge Town players showed a different side to their character on Saturday. Having won the vast majority of their Hallmark Security League First Division North matches by sweeping away the opposition, Town ground out a 2-1 win at Prestwich Heys on Saturday. With nearest challengers Avro in First Division Cup action, the win meant Town are nine points clear at the top after playing three games more. “We weren’t at our best and I thought a lot of them were under par,” Ashcroft told the club website following Saturday’s victory. “They had to roll up their sleeves which was something they haven’t had to do a lot this season. First-half goals from Ryan McKenna and Jay Hart set up Town’s victory, even if they saw their lead halved with 20 minutes left. Hart’s goal was his 28th of the season and came days after he was named the division’s player of the month for January. “I’m chuffed for the lad,” Ashcroft said. “It’s reward because he’s been fantastic since joining and a breath of fresh air around the place. “It was a great goal but the others had to dig in; Ryan McKenna won his headers and Lee Dovey was commanding, certainly in the second half when the free-kicks came in. It was a game that saw debuts for Daniel Wisdom, Aaron Fleming and Chris Turner, as well as a first appearance off the bench for George Thomason. Despite having to field a rejigged team, Ashcroft was pleased at how the new boys settled in. He said: “Dan has been out for a year with a ruptured Achilles; he’d signed for Bamber Bridge in the week but he needs games. “Aaron came in from Kendal Town; he’s an exciting winger and, on his day, he can be sensational.